The first section focuses on three types of tenures: social and private rented sectors as well as home ownership; it also looks at data from tenants/renters, such as socio-demographic backgrounds, affordability, average rental costs. Furthermore, the analysis takes a look at the development of rates for overcrowding and under-occupation per tenure type as well as tenant well-being. The second section presents findings about the current housing stock in England (age, size, type of home); this includes data on maintenance issues as well as health and safety. 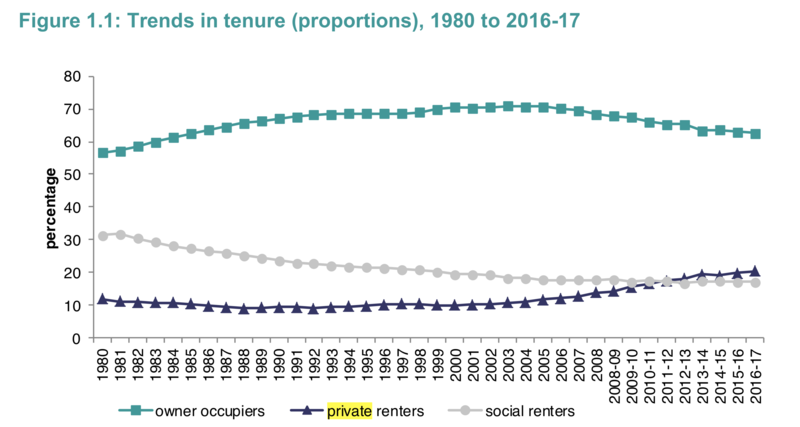 While Owner Occupiers still are the majority of households in England, the number of private rented housing continued to increase between 1980 and 2016 (see figure 1.1). Especially among 35-44 year olds more people tend to choose private rented sector housing - the numbers went up from 11% to 29% over the past ten years. No such increase happened in the social rented sector for the same timespan. For the younger tenant segment of 25-34 year olds, the increase is equally noticeable as it went up from 27% in 2006-07 to 46% in 2016-17. With the numbers of tenants in private rented sector housing growing, the proportion of young home owners went down from 57% to 37%. Overall, the private rented sector (PRS) continues to outmatch the the social rented sector in size. 20% of all household are n the private rented sector, that's 4.7 million, while the social rented sector accounts for 17% of English households (3.9 million). PRS is also dominating the London housing market. In London, private renting was the most prevalent tenure (30%), followed by outright ownership (25%). Looking at buying intentions, the number of tenants in private rented housing with plans to own a house did not change over the past year. The situation is a little different for tenants in the social rented sector, where more tenants plan to buy a house in 2016-17 if compared to 2015-16 (up from 27% to 30%). Overcrowding remains an issue in rented housing, for both private and rented sectors, but didn't change much in the past year. The problem is slightly smaller for the private rented sector, where 5% of households report the problem (that's 231,000). The overall number of under-occupied households decreased from 17% to 15% over the past 20 years in PRS. Interestingly,landlords and renters in PRS also seem to take health & safety issues more seriously as the proportion of households with a working smoking alarm went up from 83% to 88%. Find the full headline report here. It is only the first of several publications and The Ministry announced to release follow-up reports on the 2016-2017 survey this summer. We will keep an eye on all new publications and summarise relevant findigns here on our blog. Don't miss any new story and follow us on Twitter, LinkedIn and Facebook.